I had one of those "I love technology" moments this morning. I'm chatting with my friend Jay, and he wants to meet up for lunch at a Caribbean joint named Calabash. Instinctively, I run a search on Google Maps, and quickly find the spot. Then I notice a hyperlink in the information bubble that says "Send". Do you know what it does? It allows you to send the location you've found on the map to either your phone, your email, or even your GPS. GPS? I just got a Garmin Nuvi 265WT on boxing day! Alright, let's try this out. All I need to do is install a plugin from Garmin, connect my GPS to my Mac via USB, and click this Send thingy on Google Maps, and ... presto! 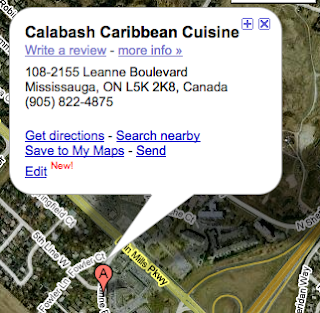 The Carribean restaurant is now a favourite on my GPS. Damn, blogging about this is making me hungry. Now I just need a Send link for food to go directly into my stomach. this ain't about Calabash! so much hate in your heart.